The Apex Prophecy Gas Inset Fire breaks from the traditional inset fire featuring a fret and frame, this 4 sided inset gas fire is inset into a fireplace surround and is available in five different frame finishes and six different back lining and is available to run on either natural gas or LPG via a class one or two chimney or flue with an inset depth of 338mm. This contemporary frame design would fit with most modern interiors and would provide ample heat output at 4.75Kw and 76% efficiency to heat the average living room and with the inclusive remote control would allow you to adjust the fire without leaving the comfort of the sofa. The Apex Prophecy can be finished in Gold, Burgundy, Colorado Silver, Holographic Black and Satin Black with the fireback in Reeded, Plain or Brick effect in either black or beige so it can be customised to fit in with most home modern or contemporary decor style. A more traditional yet contemporary look could be created using this fire with the gold effect frame and beige back inside a neutral coloured surround to showcase the strong modern lines of the frame while utilising harmonious colours to create a more traditional feel. 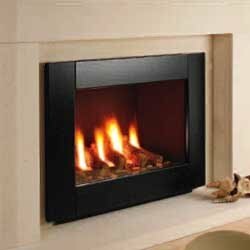 This modern inset fire looks great with the Black Satin frame and black brick lining in a neutral coloured surround really attracts the eye with the strong lines of the frame and bold colour that draws attention to the log fuel effect and realistic dancing flames, contrasting with the neutral colours in the room to create a focal point and make the fire the centre of attention.